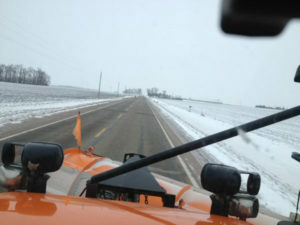 View from DOT snowplow camera in northwest Iowa. 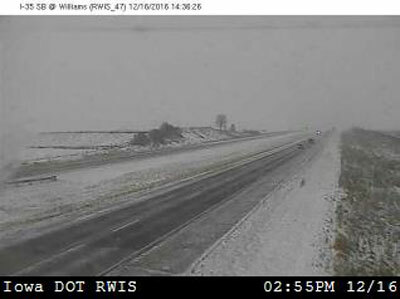 The Iowa Department of Transportation has been preparing for a couple of days for the first statewide winter storm of the season that is now moving in. Winter Operations Administrator Craig Bargfrede says the operators of the 902 plow trucks were making sure they have what they need to clear the roads. “All the garages have been preparing making sure all of our equipment is operational. Making sure all the trucks are loaded and ready to go as far as materials go. Some of our garages have been receiving some materials the last couple of days,” Bargfrede says. Like a lot of other Iowans, Bargfrede and the DOT crews are trying to determine where the storm is going to hit. He says they are watching the forecast, the air temperatures, the pavement temperature and the type of precipitation each area is going to receive and that will dictate what type of treatment they will use. They have a new tool this year — a GPS system in the trucks which will send back lots of information once they are out in the storm. View from DOT camera on I-35 near Dows. “Truck location, truck direction, it allows us to track type of material usage. So, it’s a tool that really helps our supervisors and our garage managers to be able to manage their resources better,” Bargfrede explains. He says they’ve done some pre-treating of roadways, but putting down more salt brine and salt doesn’t help in certain conditions. “Once you get down in the low 20s into the teens — and based on the type of precipitation we are receiving — that isn’t quite as effective,” Bargfrede says. Winter operations can sometimes be in full swing in November, but that hasn’t been the case this year with unseasonably warm weather last month. “We’ve been very fortunate that November was a fairly quiet month. We did have a couple of events that clipped the northwest corner of Iowa and one that hit the northeast, north-central part of Iowa,” Bargfrede says. “But as far as statewide events go, last weekend was really the first time for the whole entire season so far that we had a statewide event.” The plows haven’t been out much and that means motorists haven’t been on the road with them. Bargfrede asks that everyone take the proper precautions. “We always ask that you take it slow around our operators and don’t crowd the plow. That’s a pretty famous standard saying that we put out there,” according to Bargfrede. “The operators are doing their best to try and get the conditions so that they are back to normal season driving conditions as quickly as possible.” The entire state is blanketed with winter weather watches and warnings, and most of the state is expected to get some snow.